Topstitching refers to rows of stitches that are stitched to the surface of the fabric on top of the seam. Topstitching makes a seam stronger, highlights the design lines, and helps the seam lie flat, as well as adding a decorative element to the garment.In Figure 6.lc, the angled seam on the high-waisted pants is topstitched-do you notice how your eyes are drawn to the seams? Topstitching can be applied by machine or by hand to open or closed seams; however, because o f the thickness of closed seams, it is more successful in the latter. 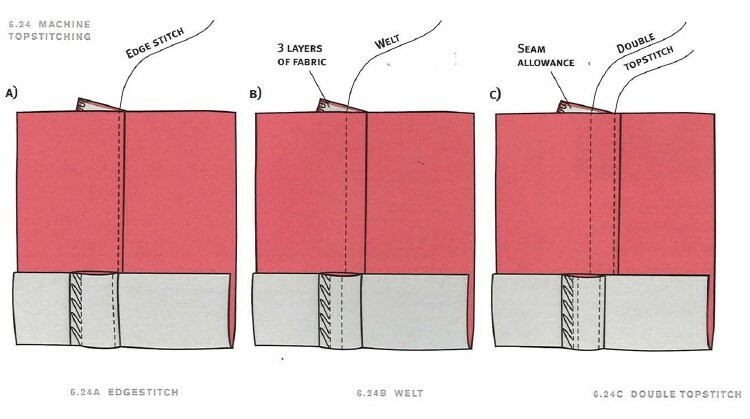 The seam allowance in a closed seam acts as padding, enabling the topstitching to sink in, and slightly raising the section between the seamline and the topstitching. Look at each of the topstitched seams in Figures 6.24. Observe how each seam has been stitched. Three layers of fabric (seam allowance and outer layer of fabric) nicely pad the topstitched seams. Notice the seam allowance is not graded. Topstitching can be one, two, or three rows of permanent stitches, zigzag stitches, or decorative stitches-the choice is yours! Twin needles can also be used to stitch two rows of topstitching in one stitching process. Making it a quicker method. Figure z.2.22bI Illustrates what a twin needle looks like. 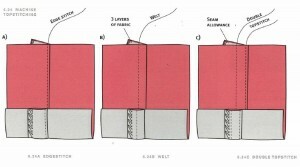 Each seam has been stitched with a 1/2 inch closed serged seam (see Figure 6.1ob). Increase the stitch length-the more layers of fabric there are, the longer the stitch length needs to be because the stitches sink into the fabric. Topstitching thread, single thread, or two strands of thread in matching or contrasting colors can be used for topstitching. Use a largersized needle for two strands and topstitching threads, as the needle eye will be larger and easierto thread. With the correct side of the fabric facing up, stitch a row of top stitching 1/16 inch away from the seamline (Figure 6.24a). The name says it allthis is edge stitching! With the correct side facing up, line up the presser foot so it butts up next to the seamline.Stitch ‘/3 inc h away from the seamline. By keeping the presser foot butted up next to the seamline, the topstitching will be parallel for the entire distance (Figure 6.24b). A double topstitch combines an edge stitch and a welt. With the correct side of the fabric facing up,Look at the Style I.D. in Figure 6.ld. Do you see the angled topstitched seams? stitch a row of edge stitching (see Figure 6.24a). To stitch the next row of stitching, line up the presser foot next to the seamline and notto the edge stitching. Stitch the second row of topstitches for the entire distance so the two stitching rows are parallel to each other. The totalwidth of the stitching from the seam line should be *Iin4ch ( see Figure 6.24c). time and care will be needed when stitching. When topstitching a circular seam, stitch in short bursts of approximately 1 inch at a time, then stop (with the machine needle down in the work), turn the fabric slightly, and continue to stitch. The circular seams in Figure 6.lb in the Style I.D. have been carefully opstitched. Alternatively, hand-walk the sewing machine. Figure 2.23 shows the location of the handwheel on the sewing machine. To handwalk the machine, turn the wheel with your hand; this allows you to stitch very slowly and carefully. Your feet don’t touch the pedal when you hand-walk the sewing machine. Topstitching an angled seam is the same as stitching a seam-just pivot on the corner. Look at the Style I.D. in Figure 6.ld. Do you see the angled topstitched seams? A twin needle has two needles that sit side by side. 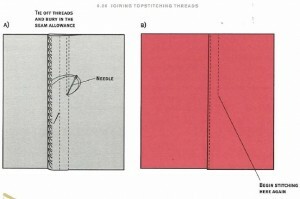 Twin needle topstitching produces two “perfect”parallel rows of topstitching (Figure 6.25). Twin needle topstitchingis ideal for knits as it allows the knit to stretch. Twin needles come in different sizes and widths-numbers such as 2.5 and 4.0 refer to the distance between each needle; numbers such as 75/80/90 refer to the needle sizes. 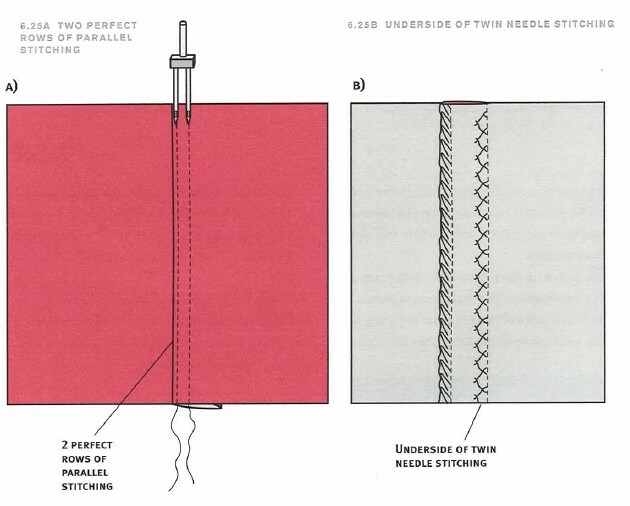 Chapter 2, “Sewing Machine Needle Types,” describes twin needles in detail. On fine knits, tissue stitch if the twin needle stitching does not lie flat. Twin needle stitching can be used to topstitch woven fabrics, and it works well on denim. Hems can also be twin needle stitched. 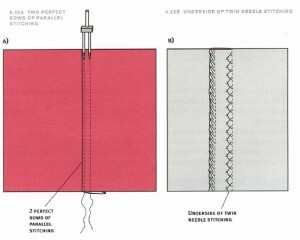 In this chapter, the section on “Stretch Seams” provides more information about stitching knit fabrics. Thread two strands of thread through the sewing machlne; separate the threads just above the needle by hooking them apart before threading the two needles. To stitch, line up the presser foot to the sea mine and carefully stitch. The two rows of stitches will be perfectly parallel to each other (Figure 6.25a). On the wrong side of the fabric, the stitches loop over a central thread, forming a small zigzag. Any zigzag stitching motion is “ideal” for stitching knits and allows the seam to stretch (Figure 6.25b). If Your Top stitching Thread Breaks. Pull the broken threads through to the wrong side, tie the threads together, and thread through a large-eyed needle. Bury the threads into the seam (Figure 6.26a). Begin top stitching again by placing the machine machine needle directly in the stitch hole where the previous topstitch broke (Figure 6.26b).Continue to stitch from this point to the end of the seam.From the correct side, the topstitching join will not be visible. When topstitching by hand, time and patience are required to produce nice-looking, even stitches. Outlined here are a saddle stitch and a pick stitch. These are not the only hand topstitches designers can create their own variations of hand topstitching. Purchase embroidery thread and a needle with an eye large enough to thread comfortably. in a huge assortment of colors. Saddle stitches are evenly spaced and stitched approximately %-inch long and 1/4-inch apart. (Figure 6.27a). It is important that the stitches be placed parallel to the seamline. Hand stitch a sample first to experiment with the thread type, color, needle size, and width of topstitching. A pickstitch is a small stitch showing on the fabric surface with a longer stitch underneath (Figure 6.2713). Twin needle topstitching is difficult on angled corners; however, it can be stitched around princess and circular seams.